If there was any doubt over how much conservative media shapes the White House's messaging and policy goals, President Donald Trump's Twitter on Wednesday morning may have dispelled that notion. 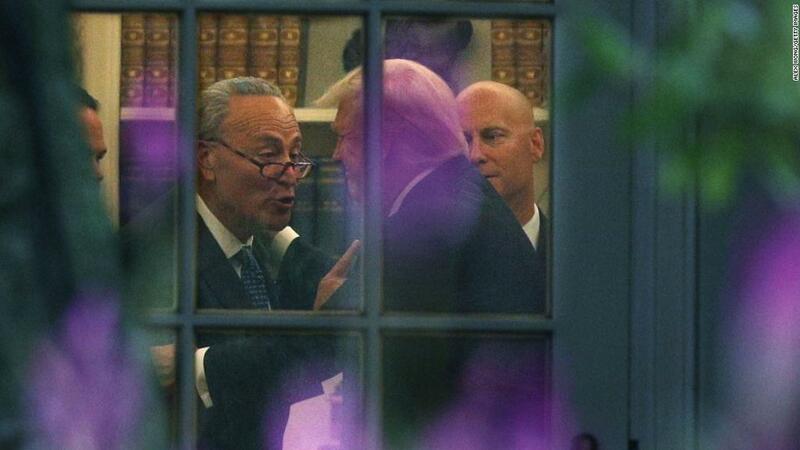 Less than 24 hours after a truck attack in New York City left at least eight people dead and dozens injured, Trump directed his social media fury toward an immigration program that he suggested Democratic Sen. Chuck Schumer helped conceive. 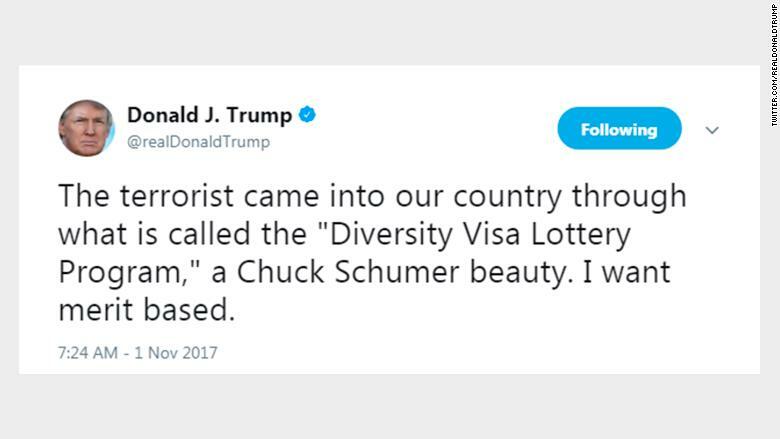 In a tweet sent shortly before 7:30 a.m., Trump said the 29-year-old allegedly responsible for the attack came to the United States on a "Diversity Visa Lottery Program," which the President described as a "Chuck Schumer beauty." Within hours after that tweet, Trump called on Congress to eliminate the program, which his administration has sporadically criticized through official White House communications. Trump had never mentioned the program on Twitter or in stump speeches prior to the attack. But by the time he made his feelings known on Wednesday morning, criticism of the diversity visa -- and Schumer -- had already become a calcified narrative in conservative media, from fringe right-wing websites to the opinion programs on Fox News. The White House did not respond to a request for comment, but Trump essentially confirmed in another morning tweet that he was tuned into Fox's coverage of the truck attack on Wednesday morning. A story from a local ABC News affiliate sent a pair of far right, pro-Trump websites into overdrive. 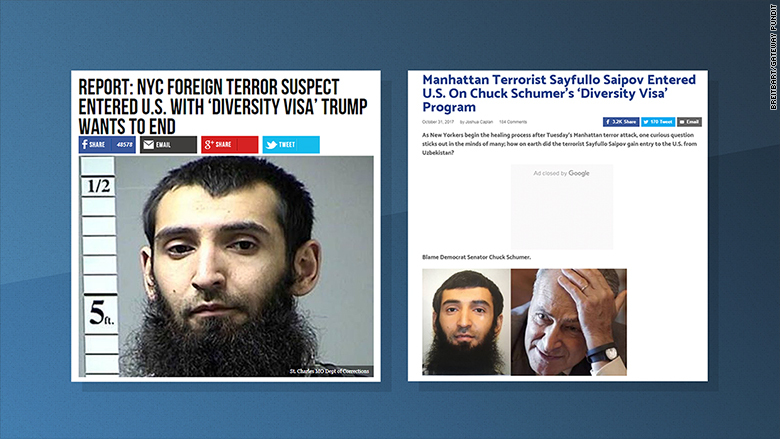 The story said that suspect Sayfullo Habibullaevic Saipov "came to the United States seven years ago from Uzbekistan under what is called the Diversity Visa Program," a claim the Department of Homeland Security confirmed on Wednesday afternoon. Soon after, Breitbart had aggregated the ABC report and made it the top story on its homepage. Gateway Pundit went even further, laying blame on Schumer for how the attacker ended up in the United States. 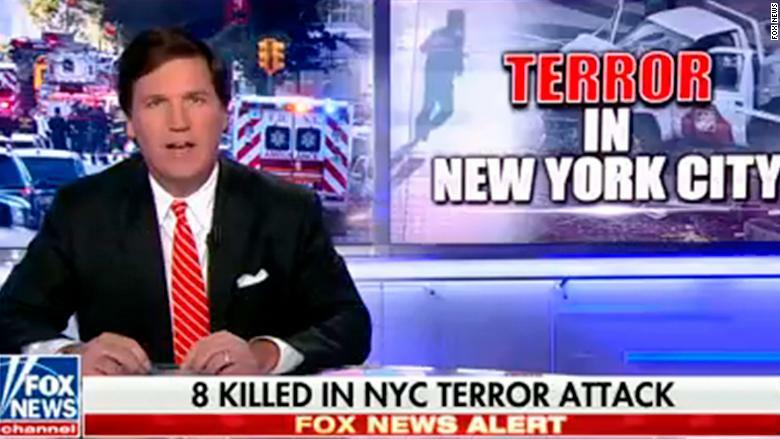 Discussion of the diversity visa dominated Fox News' prime time lineup on Tuesday, beginning with Tucker Carlson's program. 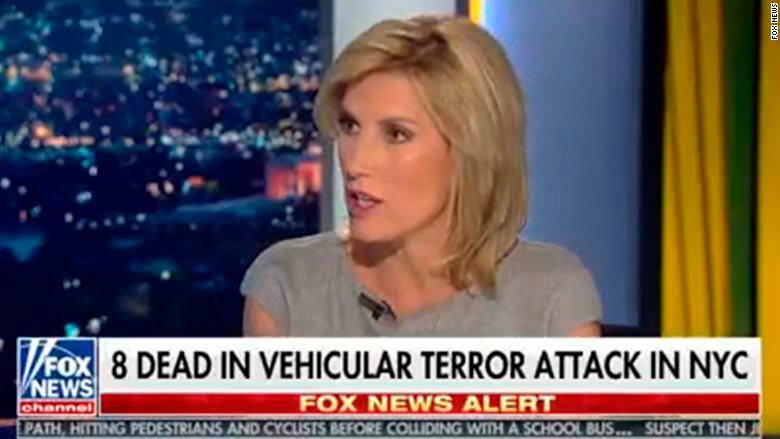 Carlson kicked off his show at 8 p.m. by getting viewers up to speed on the attack, saying it was carried out by "an apparent Muslim extremist admitted several years ago under a diversity visa." A bit later in the program, Carlson revisited the topic during an interview with former Trump campaign adviser Walid Phares. "Given that program, how can we vet for people like this?" Carlson asked. "The big 'V' is the issue," Phares replied. "Vetting." It's worth noting that those entering the country under this program are still subject to the same security and eligibility requirements as other immigrants. Toward the end of his broadcast on Tuesday, Sean Hannity brought on conservative radio host Mark Levin to discuss the attack. "What's very interesting about this mass killer, he came here in 2010. He was 22 years old. He wasn't a four-year-old who came across the border with his mother," Levin said. "He came here, he was 22 years old. He came under a program called the diversity visa program." Levin said he had been "digging" into the program, which has long been the subject of bipartisan opposition in Washington. Under the program, 50,000 visas are distributed by a random selection of countries from where there is a low rate of immigration to the United States. Schumer helped shape the 1990 legislation that created the program, but he was also instrumental in the 2013 immigration bill passed by the Senate that would have replaced the diversity lottery program with a merit system. That legislation drew staunch opposition from many of the same conservative critics calling for an end to the diversity visa program in the wake of this week's attack. In his interview with Hannity, Levin noted Schumer's role in the 1990 bill. Minutes into her program, Laura Ingraham said she was trying to turn her "righteous indignation toward action." Appearing as her guest was Jim Hanson, the president of the Security Studies Group, who immediately questioned the wisdom of the diversity visa program. "I don't think that qualifies jihadism as something we want diversely entering this country," Hanson said. Later in the interview, Ingraham and Hanson were in agreement with what "action" needed to be taken in the wake of the New York City attack. "The diversity visa program has got to end," Ingraham said. 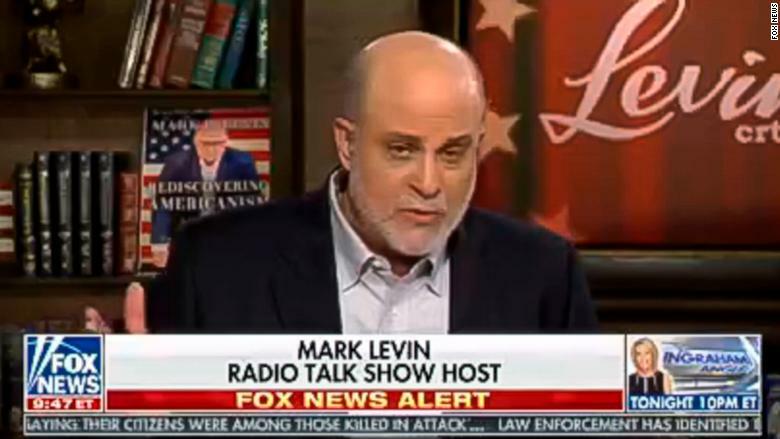 It appears that Levin's commentary from the night before informed Fox News' morning coverage on Wednesday. "Fox & Friends First" played a clip from his interview with Hannity shortly after 4 a.m., and again after the 5:00 a.m. hour. At 5:18 a.m., anchor Jillian Mele noted that she had read that the diversity visa program can provide 50,000 people a year with a permanent residence. "A lot of people are saying at this point in time, in 2017, this program just doesn't serve our national interests," Mele said. 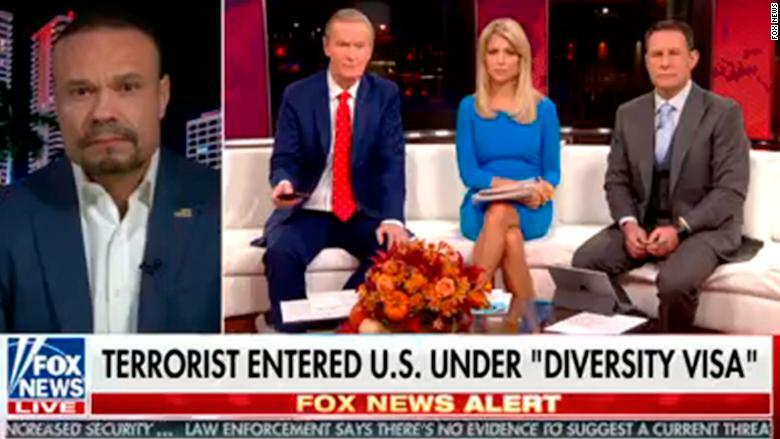 "Fox & Friends," Fox's flagship morning show, raised objections to the diversity visa program throughout its three hours of airtime. 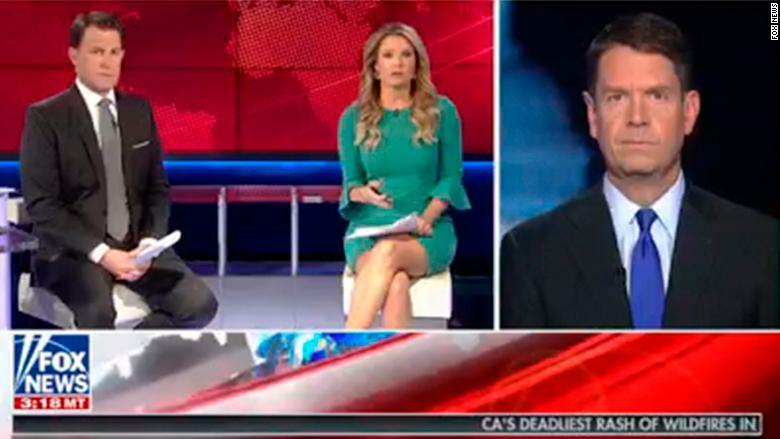 "Let's talk about how he got here," co-host Brian Kilmeade said minutes into the broadcast, before describing the visa program in a tone that could be interpreted as sarcastic and noting that it had been highlighted as "a huge weak spot for our country." "You think so?" Kilmeade said. The hosts later brought on guests, who heaped more criticism on the program, including former NYPD officer Dan Bongino, who was brought on shortly after 6:30 a.m.
Before asking Bongino to weigh in on the vetting of immigrants, co-host Steve Doocy noted that Schumer "successfully attached to the 1990 Immigration Act his diversity visa proposal, also known as the green card lottery, intended to bring in more people from Europe and other countries as well." "In the last 15 years, we have admitted close to two million people from predominantly Muslim countries," Bongino replied. "Put that in perspective: the country only has about 300 million people. How much more diversity do you want? Diversity visa program? How about a United States first immigration program?" 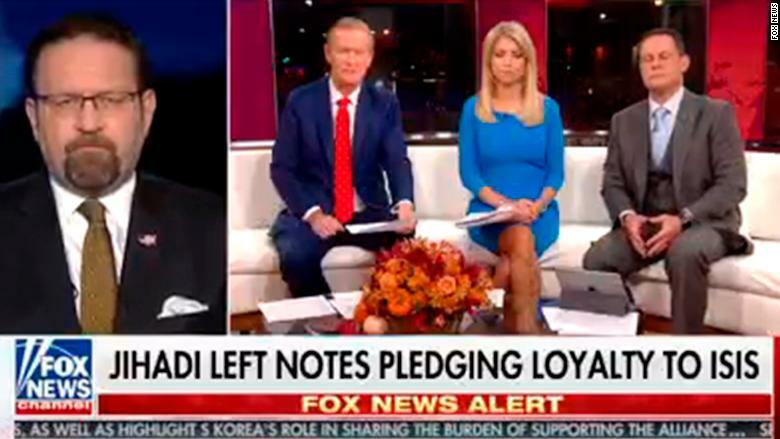 The talking point moved closer to Trump's orbit shortly after 7 a.m., when former White House adviser Sebastian Gorka joined the hosts of "Fox & Friends." Doocy teed up Gorka by again detailing Schumer's role in the 1990 legislation. "I mean, we are the most diverse nation the world has ever seen," Gorka said. "We don't need a lottery," one of the co-hosts shouted off screen. In his first tweet of the day, Trump echoed the narrative emerging out of the right-wing media ecosystem.